Here at New Blood Art, we like to share investment tips with you and when an artist is on the cusp of gaining additional recognition and value, it’s the perfect time to invest. In this section of the blog we will keep you updated with the latest news about our artists and share advice about which artists to invest in and when. We have a solid track record for identifying artists who go on to do very well – so what is bought as affordable art often becomes materially more valuable over time, with examples of artists increasing as much as 1000% in value since first showing with the gallery. Since 2004 New Blood Art has identified and promoted UK emerging artists who have gone on to gain critical relevance and recognition and see the value of their work significantly increase in value. 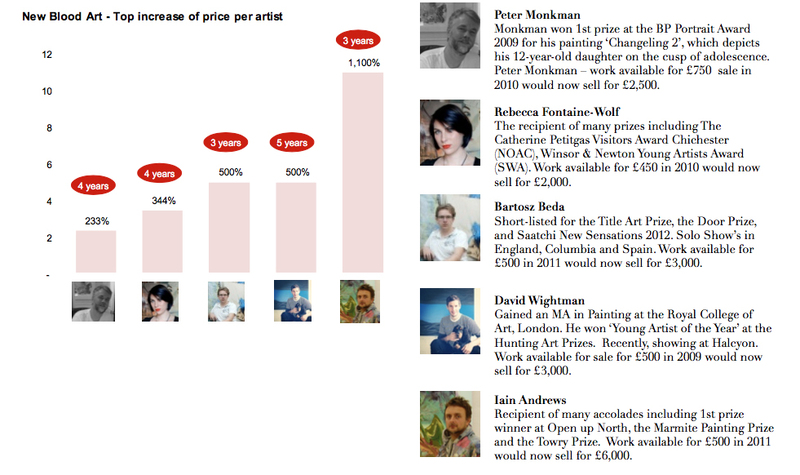 See some examples below of artists we have tipped ahead of price increases, including Peter Monkman, Rebecca Fontaine – Wolf and Iain Andrews. In addition to the above list at graduation Orlanda Broom’s prices were in the low hundreds for 100 x 100cm and are now (May 2017) £7,800 for the same sized piece and for slightly larger work at 120 x 150cm they were available at her degree show for between £600 – £800 and are now selling for £12,950. Orlanda graduated 20 years ago – graduating from her BA in 95 and in 97 from her MA. Investing in Emerging Artists. What to look for? New Blood Art founder Sarah Ryan discusses the characteristics she looks for when identifying investable artists in this article originally published in Money Week. Sarah and New Blood Art have been widely featured in the national financial press for their success in identifying investable emerging artists right at the start of their careers, when their prices are at their lowest – see our press section for more details.